Designed for SAP users as a quick reference or for computer science and business students, SAP SD Questions and Answers includes all the major concepts related to SAP SD functionality, technical configuration, and implementation in an easy-to-understand question and answer format. This organized and accessible format allows the reader to quickly find the questions on specific subjects and provides all of the details to pass certification exams in a step-by-step, easy-to-read method of instruction. Topics Covered: Invoicing; Distribution Points; Backorder Processing; Account Determination; Material Master; Transaction Codes; Partner Procedures; Rebates and Refunds Interfaces; Condition Types; Inventory Issues; Administration Tables and more! 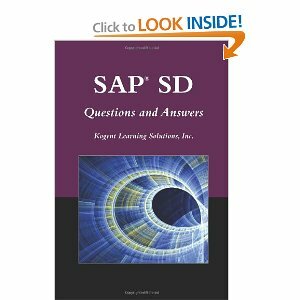 As the title implies, this is a book of questions and answers related to the SAP Sales and Distribution module. It is divided into nine chapters, each of which has from a dozen to 150+ questions and of course their answers. It can serve as a guide to preparing for the SAP certification exam, as a quick introduction, as a review of the module, or as a summary of the material in a big book on the SD module. I find that this is a very handy book to use when I need a quick reminder about something. Its format makes it easy to find things. As an example if you need to know the transaction code for something, all of them are listed in a table beginning on page 135. But if you need to know what a transaction code is and how to use it, then you need to go to a bigger book. As such I recommend that you use this book in conjunction with a bigger handbook or reference book. If you want to download this book, please click the picture of the book. You will be redirected to Amazon website where you will offered with an option to download Kindle version of this SAP SD book or purchase a paper version of it.